Trey Wright is another talented musician to add to the must-hear Athens/Atlanta circle of Dromedary and Kenosha Kid. 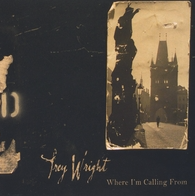 Blessed with a true gift of tuneful composition, Wright fills Where I'm Calling From with strong hooks that will stay with you for a long time. Furthermore, he knows how to arrange and build a track to tell a story, merging music and drama into a seductive mix that maintains a strong grip on your attention. With its mainstream accessibility and distinctive sound world, Wright's music is truly original. His overall sound is a mix of folk music drone, mixolydian modal tunes that flirt between major and minor, and light, Latin-swaying tunes, all played with a jazz ethos, meaning that there is a palpable freeness. In tension with this freedom, the arrangements often eschew the “jazz solo” in exchange for an overall group sound that reflects the Oregon countryside which inspired them. The main group is a trio of the guitarist/leader, bassist Scott Smith and drummer Marlon Patton, who manage to create a sonic envelope that feels much bigger than what a trio could create. Spicing up the sound are guest appearances by tenor saxophonist E. J. Hughes, alto saxophonist Mace Hubbard, trombonist Kevin Hyde and bassist Carl Lindberg (on djembe). There must be something in the water in Georgia, because the three groups mentioned above share a main characteristic, while sounding quite different: technicality takes a back seat to musical and emotive expression. At the same time, there is the unmistakable feeling that any one of the band members could just rip off a line at any time. The lack of a sense of control permeating their music is most definitely a reason it is so attractive. Complexity and energy can be attractive in their own right, and the energy range of Where I'm Calling From is relatively narrow. Perhaps sensing this, Wright throws in “Garlic and Greens,” which, as a straight, swinging blues, might sound quite out of place, except that there is a country & western undertone to it all. Overall, though, Wright and his band have created an attractive release. By the time it's over, you just might hit that play button again. 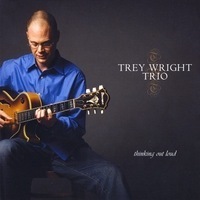 Atlanta guitarist Trey Wright is quickly becoming one of the most interesting guitarists on the scene today. A longtime member of the modern jazz outfit, Squat, Wright’s debut album Where I’m Calling From, proves that he can also make great jazz as a leader as well as a sideman. The playing and writing on this album are more reminiscent of the east coast vibe of the late ‘90s and early 2000s than of what one would expect from a group residing in the American south. The music is edgy, energetic, and will keep you glued to your speakers throughout. Of particular note is the performance of E.J. Hughes on tenor sax. Hughes has the control to play a slow-moving gripping solo full of melodies and motives as well as turn out a burning, intense solo, and he knows exactly when to play the right notes with the right emotional context. The tunes were all written by Wright except for Nick Drake’s “River Man,” a tune often played by pianist Brad Mehldau, whom Wright cites as one of his biggest influences. Each tune sounds like a composition, not just a vehicle for blowing on. As well, the diversity of each tune allows the album to grow on the listener and not become stagnant or repetitive. I would highly recommend this album to any fan of jazz guitar, especially those who are into the more modern players like Kurt Rosenwinkel, Adam Rogers and Ben Monder. Though it is easy to group Wright in with these great guitarists, his sound and writing put him in a category of his own.